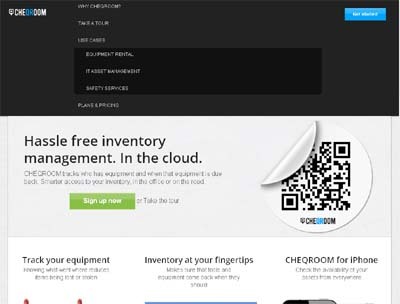 CHEQROOM allows you to track your equipment inventory in the cloud. It can be used for: Rental Businesses, IT Asset Management and Safety Service Businesses. CHEQROOM makes managing inventory easier because it uses QR code stickers which can be used to label your valuable assets. You can use our web app to access your inventory from anywhere. CHEQROOM is a disruptive technology for tracking inventory. Inventory Management tools used to be synonymous with static, bloated and overpriced software. CHEQROOM increases efficiency of rental business by combining QR code stickers with online / mobile apps. Our software tracks who has equipment and when that equipment is due back. Smarter access to your inventory, in the office or on the road.